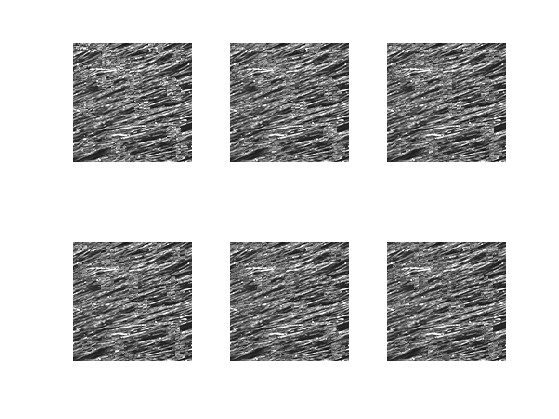 This numerical tour explores texture synthesis and inpainting using patch averaging. Given an exemplar image, we extract many patch that are our library. We even perform PCA dimensionality reduction to speed up nearest neighbors search. The main parameter is the width of the patches. The other parameter is the number of patch in the exemplar dictionary. We load an exemplar image. 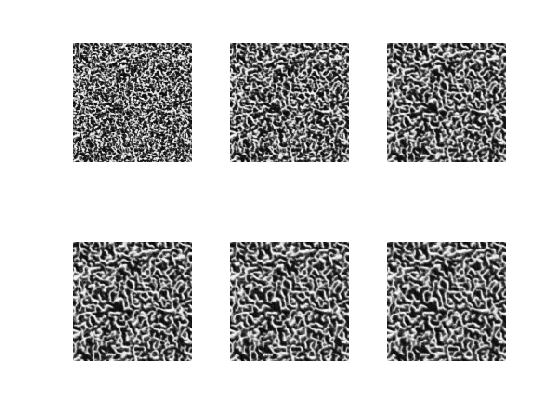 We set up larges (w,w,n-w+1,n-w+1) matrices representing the X and Y position of the pixel to extract. 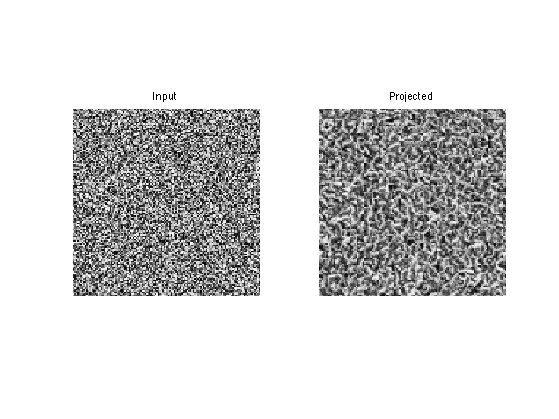 The basic step for synthesis or inpainting is to project each patch of an image to its nearest neighbor in the dictionary. The initial image is just noise for instance. We define an offset vector to shift the projected patch. This needs to be changed during the iteration of the algorithm (either synthesis or inpainting). Shift location, with proper boundary condition (cyclic). Replace each patch by its closest match. 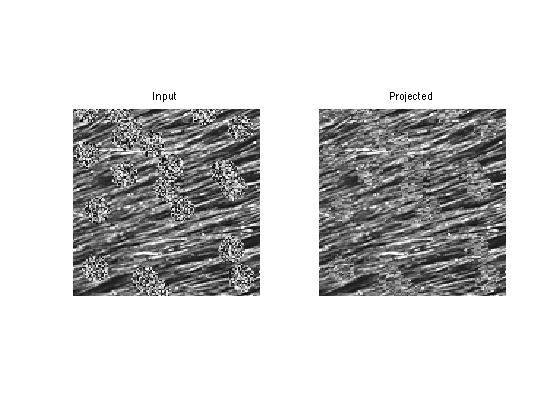 Texture synthesis is obtained by performing the projection for several offset and averaging the results. To speed up performance, we consider only a subset of all possible w*w offsets. We perform one step of synthesis by cycling through the offset. 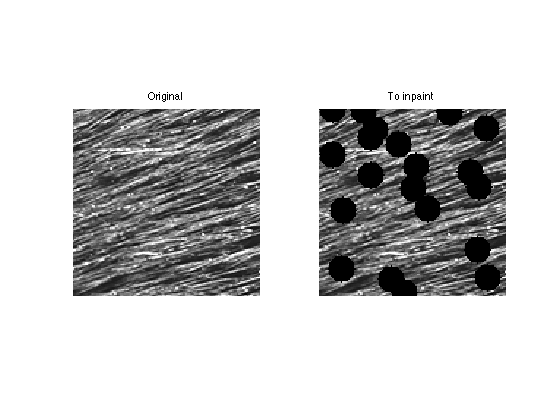 To enhance the synthesis result, we perform histogram equalization. Exercice 1: (check the solution) Perform several step of synthesis. Exercice 2: (check the solution) Perform more iteration, and increase the value of q and noffs. Exercice 3: (check the solution) Explore the influence of the parameters w and q on the quality of the synthesis. 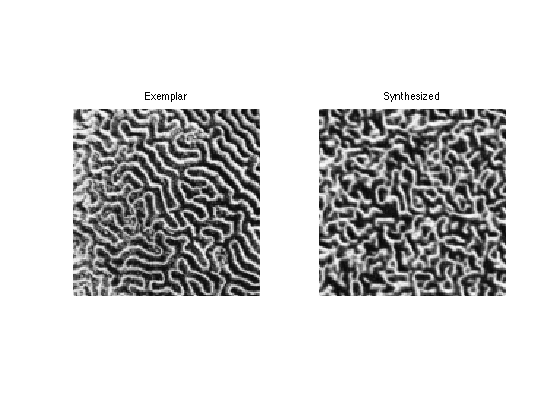 Exercice 4: (check the solution) Perform the synthesis using different textures. 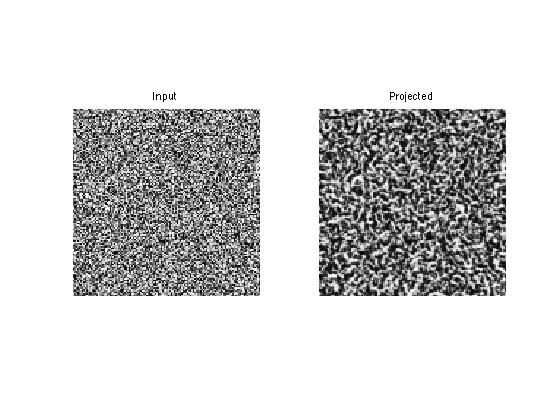 Exercice 5: (check the solution) Extend the algorithm to handle color textures. 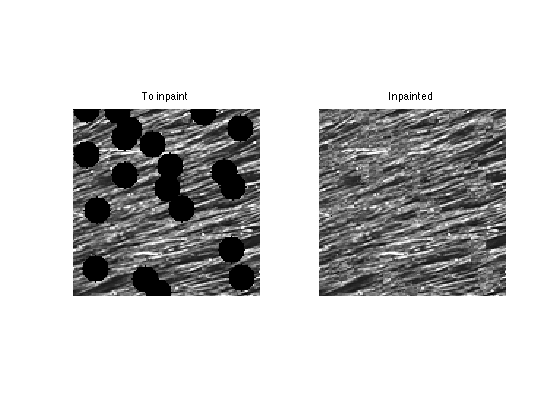 Texture inpainting corresponds to filling in large hole in an image. It It corresponds to a constraints synthesis inside the area of the hole. Compute a binary mask representing holes in the textures. Display with / without holes. Collect all the patches from the image. Remove those that cross the holes. Initialize the inpainting with random values inside the hole. Extract non-overlapping patches in the image, with a given offset. % project only a patch crossing the hole. Impose the values of the known pixels. Exercice 6: (check the solution) Perform the inpainting by repeating several time the projection with different offsets. You do not needs to average the offset for inpainting. Exercice 7: (check the solution) Test the inpainting with larger holes and with various B&W and color images.